This beguiling Japanese movie is based on "The Village of My Paintings," an autobiographical book by Seizo Tashima, whose twin, Yuikihko, appears with him at the beginning and end of the film. For the rest, 9-year-old twins, Keigo and Shogo Matsuyama, take over their roles and play them without apparent inhibition. The movie is a hymn to childhood, directed by a filmmaker, Yoichi Higashi (Love Letter, The River With No Bridge), who has an especially sharp eye for the fantasy life of the very young. It's filled with casual, almost peripheral visions of rising spirits, gabby fish and "Macbeth"-like witches observing from the trees. The magic-realist approach makes everything that happens to the boys, natural or "supernatural," seem part of the same idealized universe. The Tashima brothers grew up to be popular storybook illustrators. The script concentrates on the summer of 1948, which they spent fishing, chasing birds, wreaking havoc in a neighbor's vegetable garden, befriending an outcast schoolmate, discovering their talent for painting - and enjoying the fact that people couldn't tell them apart.It's set in a small Japanese village, and there's a strong undercurrent of nostalgia for a lost paradise. On this score, the movie is persuasive without becoming overly sentimental, thanks to Higashi's restrained approach. The final perspective is that of the grown-up twins, who have started working together on a new book about their childhood. Often reminiscent of Kohei Oguri's splendid 1982 Japanese Oscar nominee, Muddy River, which deals with 9-year-old boys living on a barge and exploring the riverside in the mid-1950s, Village of Dreams was filmed two years ago and envisioned as "a reevaluation of the Japanese people on the (50th) anniversary of the war's end," according to the director. Critical of what he believes has become "a digital nation" that has produced "a faceless system," Higashi thinks that "there is great symbolic meaning to the fact that the first indiscriminate and pointless poison gas attack in the world took place in Japan." It happened in a Tokyo subway shortly before filming began. But this is also the story of two boys spending a lazy summer together, delighting in their direct experiences with water, sun and country air, and affirming the intensity of their friendship through a series of adventures both trivial and life-threatening. It's "Tom and Huck" with just a touch of dread. 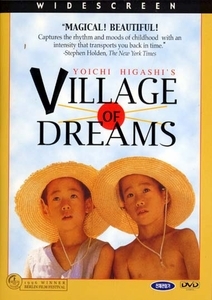 Village of Dreams won the Silver Bear award at the 1996 Berlin Film Festival. It had its local premiere at last year's Seattle International Film Festival, but still has no American distributor. In order to bring it to the Northwest for a regular run, the Grand Illusion is sharing costs with the Portland Art Museum and the Olympia Film Society.